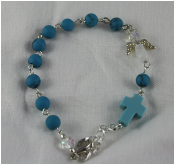 Hand crafted one decade prayer bracelet. Natural gemstone and crystal - measures approximately 7 1/2 inches in length. Turquoise heals the lungs, throat and respiratory system. It is good for laryngitis and nervousness in speech. Contains anti-inflammatory and detoxifying effects. Archangel of Music and Answered Prayers, helps with communication and expression so that you may speak your truth openly, yet your words and actions be kind and gentle, if powerful. Take time for a gentle retreat to rejuvenate and connect with peace and enjoy the present moment. He will help you live in integrity with your spiritual gifts of prophecy, healing and manifestation fully awakened. The Color Associated with Sandalphon is Cool Turquoise. The Gemstone Associated with Sandalphon is Turquoise.